Motorola has introduced its new motion-enabled 3G slider phone – MOTO W7 Active Edition, which features 2 megapixel camera with secondary VGA camera, 2.2-inch QVGA (320 x 240 pixels) TFT screen and an accelerometer that able to sense your body’s movement, orientation and hand gestures (such as quick shake or a tap on the handset) for performing tasks. According to Motorola, the MOTO W7 Active Edition that packed with motion-controlled games will incorporate built-in step pedometer and Personal Trainer application, aiming to let users stay active and entertained with the sports/fitness features. 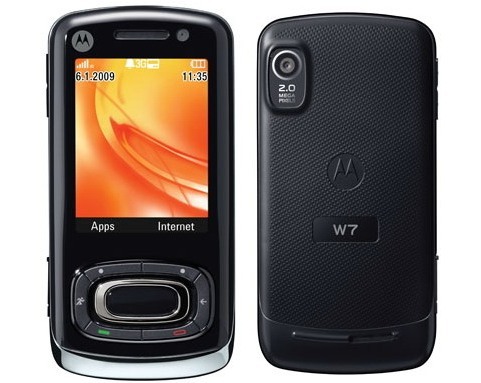 The new MOTO W7 Active Edition handset that arrives in Licorice and Alpine White colors is scheduled to be available in Asia and Latin America starting Q2 2009, but no words on its price yet.